Is anyone else loving velvet blazers as much as I am? I bought this blazer several years ago, and to be honest, it's by Juicy Couture and probably nine years old. However, I'm very happy I held onto it, and am thrilled velvet blazers are back in style. There are some items in your closet that you should just never part with, and a black velvet blazer is one. I wore mine last weekend to a birthday party and paired it with grey jeans, a white button down, and OTK boots for a classic, yet stylish, easy look. 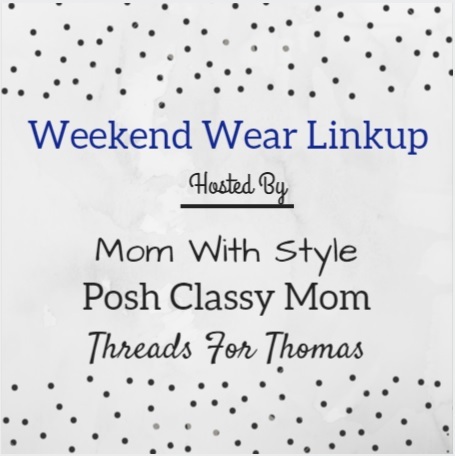 I'm so excited for Sheree from Posh Classy Mom to be joining Melissa and myself in hosting the Weekend Wear Link Up. Please join us in linking your best weekend outfits below. Wishing everyone a great weekend, and fun Super Bowl Sunday. Thank you for stopping by! Your jacket is fab and I'm loving those boots! This is such a classic chic look! You totally rock this equestrian-inspired look - Have a lovely weekend! I have never ventured into the velvet blazer idea before, but you have now convinced me that I MUST :) Have a great weekend! You created a classy look! I love your boots and jacket! I love the idea of a velvet blazer! So easy to dress up or down. Love the OTK boots! Love that velvet blazer and those boots! I'm such a fan of modern simplicity and this look hits the mark perfectly! So chic! Such a timeless piece! Love the velvet and how you styled it. Joining the linkup! I just had to take a looksie to see where your boots are from, I LOVE them. I am not sure if I could do that heel size, but I'll have to think about it. :) This outfit would be so easy to throw together, I have everything. Love it! I love velvet blazers! Sadly, I don't have any in my closet. Looks like I need to get on that! I'm loving your OTK boots too! This is the perfect pair of grey jeans ! This is such a beautiful look babe!! I love it! This look is right up my ally! So clean and chic. I didn't even know velvet blazers were a thing, but now I want one! Love how you styled it with those OTK boots too! You look so chic! Love that velvet blazer and those boots are hott! Love this! Your boots are perfect with the grey pants! I used to wear equestrian outfits like this often. Must do so again, especially before Spring truly comes and the weather gets warm for good. I love that you kept the jewelry simple here and let the blazer be the main piece. I agree that one shouldn't get rid of a black velvet blazer or a classic-shaped black blazer (like a tuxedo one). Believe it or not my first velvet blazer was from Wal Mart. It is made of the softest (real) velvet and it is cropped. I still own it and it is lovely and looks so expensive.